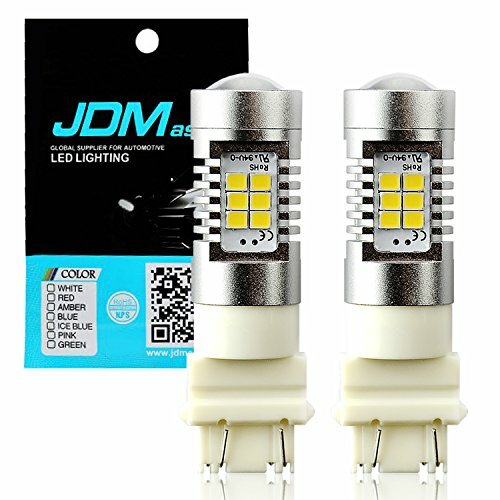 JDM ASTAR 1260 Lumens Extremely Bright PX Chips 3057 3156 3157 4057 4157 White Backup Reverse LED Bulbs by JDM ASTAR at Kart Racing Network. MPN: JDM ASTAR-3157-PX-21W-N2. Hurry! Limited time offer. Offer valid only while supplies last. (set of 2 bulbs)Buy with confidence, We offer "ONE YEAR" warranty on item(s) that confirm to be manufacturer defect. Lighting Output：2520 raw lumens, 1260 lumens for each bulb . Color:Xenon White.Size: 2.60" long and 0.75" in diameter. Fits: 3156 3056 3356 3456 4156 3157 3047 3057 3357 3457 3757 4057 4111 4157 etc. If you have any questions about this product by JDM ASTAR, contact us by completing and submitting the form below. If you are looking for a specif part number, please include it with your message.